In a recent research done by Thomson Reuters, it was found that the spending for Muslim clothing and footwear has been constantly increasing over the years. Estimating based on the facts, the report states that if this continues, by the year 2019, the amount can reach up to $484 billion. Whether it's because the brands have heard of this or they simply noticed that a huge chunk of their customers belong from the Hijab-wearing sector, more and more high and fast fashion labels are deciding to act upon it and hop on the trend. The likes of Oscar dela Renta, DKNY, Tommy Hilfiger, and Mango to name a few, have created their own Ramadan collections. 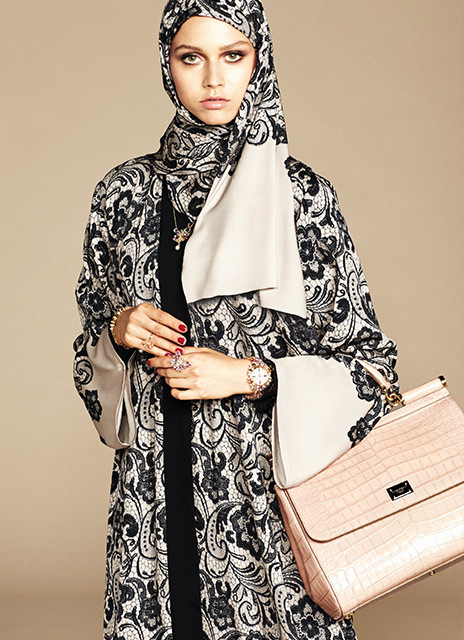 H&M, on the other hand, even featured a Hijab-wearing model for a campaign. The latest to join in the trend is Italian fashion house, Dolce & Gabbana. Made to cater to their growing Muslim and Arab audience, D&G just debuted their Hijab and Abaya line on Style.com Arabia. Although it’s comprised mostly of neutral hues, the collection boasts of the brand’s signature dramatic femininity. and daises, reminiscent of its Spring 2016 collection. Indeed, today is a good day for fashion. Enjoy, ladies!